Blog or Wiki: Which Is Best for Your Classroom Needs? While the Commons offers a number of excellent technologies that can enhance your classroom, research, and collaboration goals, sometimes the sheer amount of technologies that are available can be overwhelming. Educational technology, like any other technology, goes through phases of adoption. As a result, you may hear about a particular technology from colleagues or in articles and feel compelled to find ways to place that technology into your course plans, regardless of the fit. Or, a technology might be a phase where it seems “everyone” has finally converted, and you want to see what the hype is about. Or perhaps, you’ve already tried a particular technology and are looking to grow your technological savvy by including a new one. Regardless of your impetus for including a technology tool in your course design, in order for the technology to work you will need to have a clear sense of your expectations for that technology, the purpose in your choice to implement it, and the strengths and weaknesses of that technology in order to fully and successfully integrate it into your course design. One question we get often from the faculty we serve through the Commons is, “Should I use a wiki, or a blog?” While these formats may seem somewhat related in that they both provide a space for faculty and students to collaborate in producing and sharing knowledge, how each technology accomplishes this goal is very different. It is these differences that can help you choose the best technology for your course design, and maximize the technological potential for learning. What is commonly referred to as “blogs,” in the Commons technological toolkit is actually better described as a course website. The Commons provides course websites through WordPress, which is a platform best known for its ease of use, simple navigation, and versatility. While blogs are a central feature of WordPress sites, they are by no means the only, or even a required, feature of the site that you might decide to customize for your course. The WordPress sites’ strength lies in their adaptability. Many of the sites you see on the Internet today, with or without blogs, are built on the WordPress platform. A WordPress site is an excellent choice for course management. On these sites, you can create pages to organize all of your course materials, including documents, pictures, and even videos. You can use the blog feature to gather student responses, provide links and interesting articles to students in real time, and even as a place for students to submit peer-reviewed assignments. WordPress sites are also the platform we use to create student portfolios, where students can collect and present work they’ve done over the course of a semester, year, or major. WordPress sites can be customized in a variety of ways, including themes, menus, pages, and permissions. WordPress sites are great for tracking the progress of a course, project, or student over time. 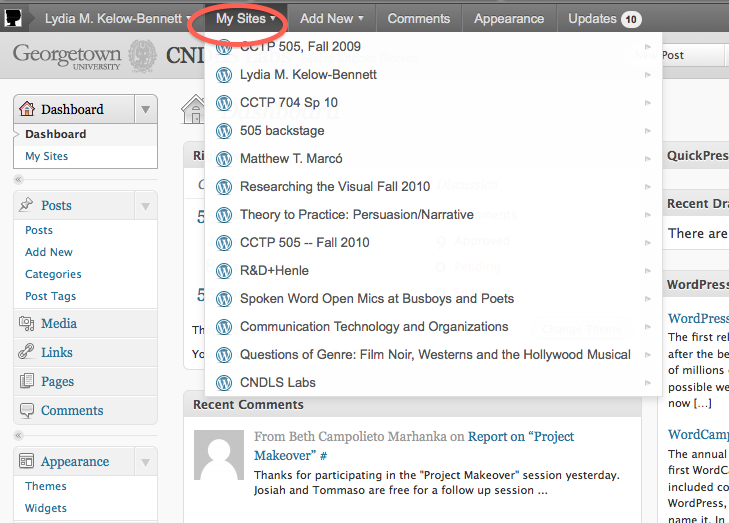 The blog feature provides date and time stamps, as well as organized ways of accessing posts by student, category, or tags, which gives you the ability to view a student’s progress over the course of a semester. Students can also benefit from reviewing previous work on their site, to see how their work has grown and changed over time. These sites are also excellent as a central organizing space that all students can use to access course materials, readings, links, and the syllabus from any computer, making them well suited for inclement weather, illness, and other challenges that occur during the semester. WordPress sites can become a little challenging to manage if students are not using categories or tags to mark their blog posts. When you have an especially large class, the sheer volume of blog entries can be hard to sort (Georgetown Commons does offer a Campus Press plugin on our WordPress sites, which allow you to sort blog posts by date and by name). Also, since the blog format is a long line of responses and comments, it can be hard to sort through all of the responses and comments for discussions between students unless you provide some additional structure. Some professors have solved this challenge by breaking students into smaller groups and having those groups comment only on their group member’s blog postings. Other professors use the blog form to collect student responses and develop discussions around those responses in face-to-face class time. Wikis are usually most closely associated with Wikipedia, for better or for worse. However, there are actually a variety of ways that wikis are used in both educational and professional contexts that have nothing to do with Wikipedia. A wiki is, in its most basic format, a tool that emphasizes collaborative production and editing of information, presented in a very basic layout. Most wikis have a basic menu, either located at the top of the page or along the left-hand side, which allows viewers to navigate between the different topics or pages. Wikis do not generally display information about who has produced and edited various parts of the site on the front end; rather, this information is available in the “history” portion of the site, where you are able to see each the creation and revision history for the site, for various pages in the site, and in each section of the site. A wiki’s layout is relatively linear. Pages are divided by headings and subheadings, which appear on the page in the order that the collaborators place them. They are minimalist by nature, and while you can sometimes change text colors or occasionally the border colors of a wiki, the visual elements from a wiki depend heavily on what the collaborators add. The strengths of a wiki are its collaborative structure, the ability to track the changes it has gone through, and the fact that it displays only the most recent version of material that has been saved to it. Wikis are particularly well suited for reference materials that are revised often and require a record of revisions, as well as for final projects that require collaborative writing. Wikis tend to be more text-heavy, though they can accommodate images as well. According to Ruth Reynard in this excellent article at Campus Technology, wikis provide a forum for students to reflect on the knowledge construction process, and assist in making knowledge useable because students encounter the knowledge in an applied context. A challenge with wikis is that they require some familiarity with basic coding, as they utilize HTML-based languages to be constructed. While this may seem intimidating at first, wikis come with ample support to learn coding, and coding is actually much easier than it may seem at first. What is important to note when using wikis, however, is that the learning curve is a little longer for students who are unfamiliar with the format. Therefore, wikis are good for projects that students will be working with over a significant period of time, where they have multiple opportunities to encounter and master the coding process. For an excellent example of how wikis are used through the course of a semester and as a final project, see Martin Irvine’s course wikis here: (Wikispaces; Metapedia Wiki) If you need assistance in deciding which classroom technology best fits your needs, Georgetown Commons staff is available to consult via email or in-person. To set up a consultation, contact commons@georgetown.edu. While the Commons offers a number of excellent technologies that can enhance your classroom, research, and collaboration goals, sometimes the sheer amount of technologies that are available can be overwhelming. While the Commons offers a number of excellent technologies that can enhance your classroom, research, and collaboration goals, sometimes the sheer amount of technologies that are available can be overwhelming. Educational technology, like any other technology, goes through phases of adoption. As a result, you may hear about a particular technology from colleagues or in articles and feel compelled to find ways to place that technology into your course plans, regardless of the fit. Or, a technology might be a phase where it seems “everyone” has finally converted, and you want to see what the hype is about. Or perhaps, you’ve already tried a particular technology and are looking to grow your technological savvy by including a new one. Regardless of your impetus for including a technology tool in your course design, in order for the technology to work you will need to have a clear sense of your expectations for that technology, the purpose in your choice to implement it, and the strengths and weaknesses of that technology in order to fully and successfully integrate it into your course design. One question we get often from the faculty we serve through the Commons is, “Should I use a wiki, or a blog?” While these formats may seem somewhat related in that they both provide a space for faculty and students to collaborate in producing and sharing knowledge, how each technology accomplishes this goal is very different. It is these differences that can help you choose the best technology for your course design, and maximize the technological potential for learning. What is commonly referred to as “blogs,” in the Commons technological toolkit is actually better described as a course website. The Commons provides course websites through WordPress, which is a platform best known for its ease of use, simple navigation, and versatility. While blogs are a central feature of WordPress sites, they are by no means the only, or even a required, feature of the site that you might decide to customize for your course. The WordPress sites’ strength lies in their adaptability. Many of the sites you see on the Internet today, with or without blogs, are built on the WordPress platform. 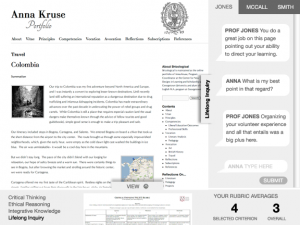 A WordPress site is an excellent choice for course management. On these sites, you can create pages to organize all of your course materials, including documents, pictures, and even videos. 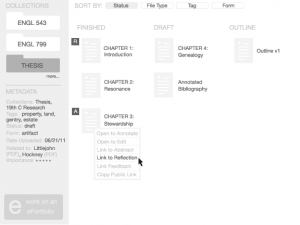 You can use the blog feature to gather student responses, provide links and interesting articles to students in real time, and even as a place for students to submit peer-reviewed assignments. WordPress sites are also the platform we use to create student portfolios, where students can collect and present work they’ve done over the course of a semester, year, or major. 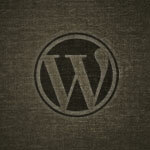 WordPress sites can be customized in a variety of ways, including themes, menus, pages, and permissions. 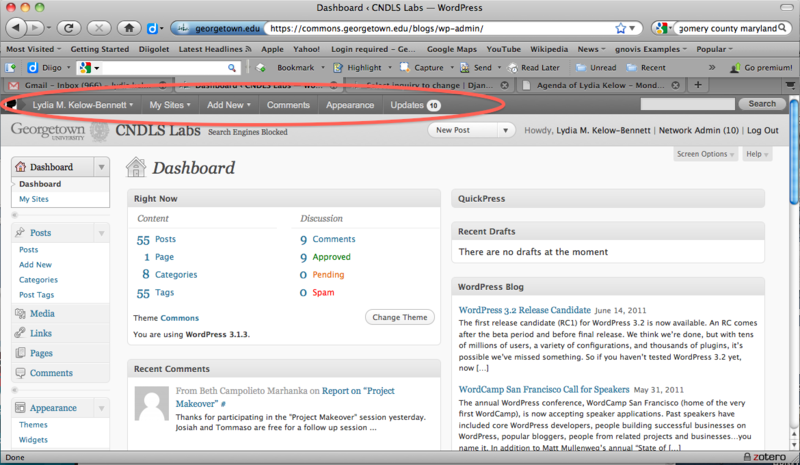 WordPress sites are great for tracking the progress of a course, project, or student over time. The blog feature provides date and time stamps, as well as organized ways of accessing posts by student, category, or tags, which gives you the ability to view a student’s progress over the course of a semester. Students can also benefit from reviewing previous work on their site, to see how their work has grown and changed over time. These sites are also excellent as a central organizing space that all students can use to access course materials, readings, links, and the syllabus from any computer, making them well suited for inclement weather, illness, and other challenges that occur during the semester. WordPress sites can become a little challenging to manage if students are not using categories or tags to mark their blog posts. When you have an especially large class, the sheer volume of blog entries can be hard to sort (Georgetown Commons does offer a Campus Press plugin on our WordPress sites, which allow you to sort blog posts by date and by name). Also, since the blog format is a long line of responses and comments, it can be hard to sort through all of the responses and comments for discussions between students unless you provide some additional structure. 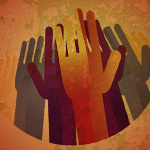 Some professors have solved this challenge by breaking students into smaller groups and having those groups comment only on their group member’s blog postings. Other professors use the blog form to collect student responses and develop discussions around those responses in face-to-face class time. Wikis are usually most closely associated with Wikipedia, for better or for worse. However, there are actually a variety of ways that wikis are used in both educational and professional contexts that have nothing to do with Wikipedia. A wiki is, in its most basic format, a tool that emphasizes collaborative production and editing of information, presented in a very basic layout. Most wikis have a basic menu, either located at the top of the page or along the left-hand side, which allows viewers to navigate between the different topics or pages. Wikis do not generally display information about who has produced and edited various parts of the site on the front end; rather, this information is available in the “history” portion of the site, where you are able to see each the creation and revision history for the site, for various pages in the site, and in each section of the site. A wiki’s layout is relatively linear. Pages are divided by headings and subheadings, which appear on the page in the order that the collaborators place them. They are minimalist by nature, and while you can sometimes change text colors or occasionally the border colors of a wiki, the visual elements from a wiki depend heavily on what the collaborators add. The strengths of a wiki are its collaborative structure, the ability to track the changes it has gone through, and the fact that it displays only the most recent version of material that has been saved to it. Wikis are particularly well suited for reference materials that are revised often and require a record of revisions, as well as for final projects that require collaborative writing. Wikis tend to be more text-heavy, though they can accommodate images as well. According to Ruth Reynard in this excellent article at Campus Technology, wikis provide a forum for students to reflect on the knowledge construction process, and assist in making knowledge useable because students encounter the knowledge in an applied context. If you need assistance in deciding which classroom technology best fits your needs, Georgetown Commons staff is available to consult via email or in-person. To set up a consultation, contact commons@georgetown.edu. Posted July 11, 2011 by Lydia M. Kelow-Bennett & filed under CNDLS, Commentary. Although our conversations about our ideal ePortfolio tool have been focused on the library piece, I’ve given the design of the assessment piece (piece #3) a first attempt at brainstorming. I’ll point out a few of the key features in my imagined version and why I think they’d be helpful for a student sending in an “ePortfolio snapshot” to be scrutinized and evaluated by a faculty member, mentor(s), or program administrators. This view, by the way, is the student view– I’ll think separately about the faculty view. Integral to my imagined design is a focus on the assessment process through two features: a place for discussion to happen and the constant presence of the criteria for evaluation. A dynamic snapshot of the student’s portfolio underlies the page. On the right you see a discussion panel, tabbed by contributor. Here, students could hold independent discussions with evaluators on the results of their evaluation for each of the rubrics or criteria. So there would be two variables: which professor, and which criterion? A student may be holding a discussion with one evaluator on one criterion and discussions with all evaluators on another criterion while yet another criterion has no active discussions at all. All the while, the dynamic snapshots can be navigated, and links in discussion (perhaps aided by a drop-down of current pages) can refer back to the dynamic snapshot. On the bottom the student would find a panel that listed the criteria on which her ePortfolio was being evaluated. Clicking on one of these (“Lifelong Inquiry” in my screenshot) would bring up a thumbnail of the rubric that could be viewed in full through a sliding panel. Having clicked on a criterion, the discussion panel for that criterion would be opened as well. The student’s averaged (if there were multiple evaluators) rubric score for the selected criterion would be displayed in the bottom right, along with an ePortfolio overall average. Still to figure out would be how a student could view his score by criterion, by evaluator— that is, if it were deemed desirable to be able to do so. It could be that the evaluator average for each criterion would be sufficient and that individual evaluator scores were kept private. The option for either should be there. To think about further is how permissions to use discussions as evidence by either student or evaluator might be made on a discussion-by-discussion basis. Perhaps a checkbox at the bottom of the discussion panel for each of the pair to independently check? Posted July 8, 2011 by Anna Kruse & filed under Ideas. link to reflection: link to another text document marked as a "reflection"
There's no single ePortfolio tool out there (as far as we can see!) that offers everything our faculty and students need an ePortfolio to offer. There’s no single ePortfolio tool out there (as far as we can see!) that offers everything our faculty and students need an ePortfolio to offer. Often an ePortfolio tool will focus on one particular component of ePortfolio-building while neglecting the others. For example, a tool that excels at making an attractive ePortfolio may not offer any satisfactory, private way for the student building the ePortfolio and his/her faculty evaluators to discuss and assess the ePortfolio. Nor might a tool that offers a strong assessment feature have the kind of library functionality that a student building an ePortfolio longitudinally would need. Hence our brainstorming sessions to design our ideal ePortfolio tool. While we discussed all three states that we consider elemental to ePortfolio building– the library, the presentation, and the feedback– we focused primarily on the first (the library) for this go-around. Here is my mockup for a library space that doubles as a useful working space for students who want to make their ePortfolio-building a steady habit rather than a last-minute hassle. We’ve discussed the importance of organizing principles like “collections” for helping ePortfolio builders keep their drafts, final papers, and other files (“evidence” in the ePortfolio lexicon) collected in an orderly way that assists with future retrieval and integration in an ePortfolio view. 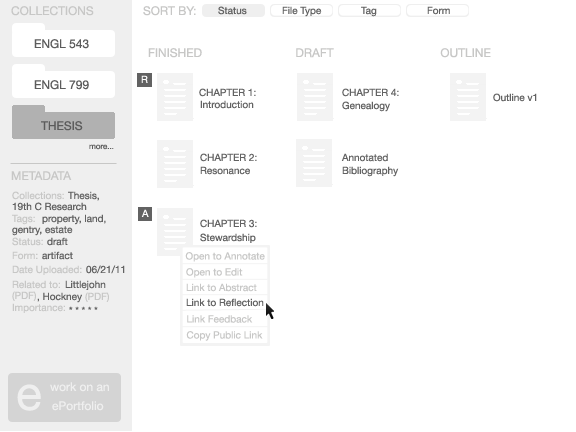 Other features of my mockup include multiple ways to sort evidence (based on elective metadata like “status,” which would include finished/draft/outline/etc., or “authorship,” which would help in distinguishing co-authored evidence from single-authored evidence or other imported sources– or even further “form,” which would distinguish evidence/artifact from reflection or other discussion that goes on around a piece of evidence). A small box with a symbol or letter would appear beside the file’s representation, indicating whether or not an annotation or reflection has been attached to that file. Posted July 5, 2011 by Anna Kruse & filed under Commentary. A recent study published by the EDUCAUSE Center for Applied Research reports that the use of clickers increased student engagement in select courses at the University of South Carolina. The report includes survey results of student and faculty perceptions about clickers as well as recommendations for best practices of clicker use. The study points to several common uses of clickers, such as peer instruction and quizzing. One interesting idea cited in the study was the integration of clicker questions into student presentations — students would write their own clicker questions and incorporate them into class presentations. I wonder whether any GU faculty have tried this approach and if so, whether it was effective. A recent study published by the EDUCAUSE Center for Applied Research reports that the use of clickers increased student engagement in select courses at the University of South Carolina. A recent study published by the EDUCAUSE Center for Applied Research reports that the use of clickers increased student engagement in select courses at the University of South Carolina. The report includes survey results of student and faculty perceptions about clickers as well as recommendations for best practices of clicker use. The study points to several common uses of clickers, such as peer instruction and quizzing. One interesting idea cited in the study was the integration of clicker questions into student presentations — students would write their own clicker questions and incorporate them into class presentations. I wonder whether any GU faculty have tried this approach and if so, whether it was effective. Posted July 5, 2011 by Theresa Schlafly & filed under Articles & Videos. The CNDLS Web development team is having design discussions around ePortfolio tools. Posted June 24, 2011 by Bill Garr & filed under Commentary. A recent update to our WordPress platform in the Commons blogs provides a number of features that enhance usability and navigation as you work with your Commons blog. None of the updates change the way you administer your site; rather, they enhance the way you can navigate your site, Dashboard, and also between multiple blog sites. This menu bar, which closely resembles the menu bar available on the standard WordPress site, provides easy access to all of your Commons sites, as well as the ability to quickly edit and add pages and posts, change your site’s appearance, and view recent comments. The menu bar has five selections available, starting with the menu headed by your name. Hovering over this menu will give you the option to edit your profile, access your Dashboard, or log out. 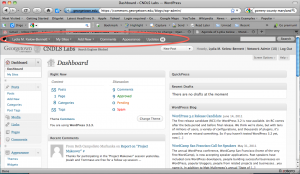 Clicking Dashboard will take you to the Dashboard of your default site. You can always confirm which site you are editing by taking note of the title at the top of the page. 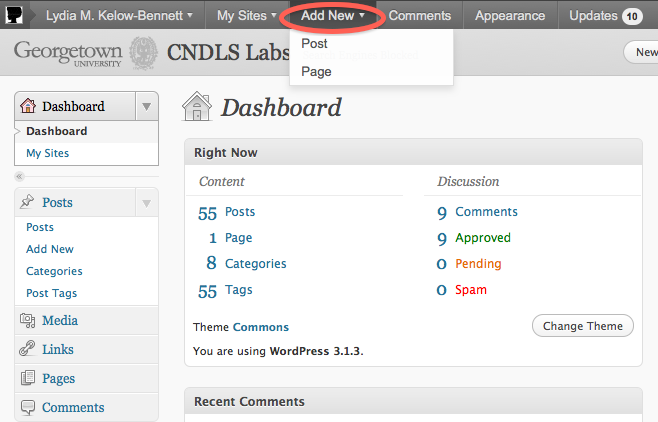 These buttons will add either a new page or a new post to the site you are currently on. 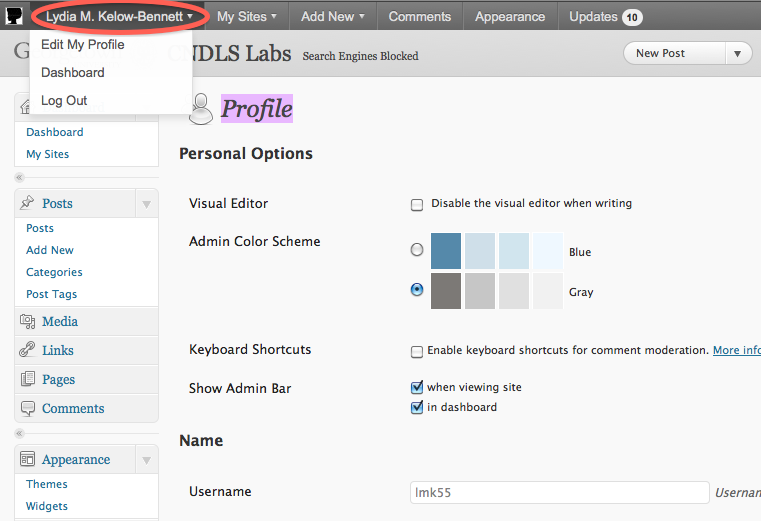 This feature makes creating new pages and posts especially easy and accessible. This feature is especially useful for moderated sites if comments require permission to be posted. Clicking this button takes you themes page, where you can choose a new theme for your site or customize the one you are currently using. The best way to take advantage of the new update features is, of course, to try them out the next time you sign on to your Commons blog! If you have any issues with the update, contact the Georgetown Commons team at commons@georgetown.edu. Posted June 20, 2011 by Lydia M. Kelow-Bennett & filed under Uncategorized. You may have seen the compelling videos "The Machine is Us/ing Us," an exploration of the significance of Web 2.0 technologies, or "A Vision of Students Today," which illuminates the student perspective on higher education. Both videos were created by Michael Wesch, anthropologist at Kansas State University, who has recently published a new version of the "Vision of Students Today" project. Wesch asked students to submit their own videos, which he then remixed into a version called "Visions of Students Today." You can view his remix, as well as many of the original videos, here. Michael Wesch spoke on "Mediated Culture / Mediated Education" at TLISI 2009. You can view the video of his talk here. You may have seen the compelling videos "The Machine is Us/ing Us," an exploration of the significance of Web 2.0 technologies, or "A Vision of Students Today," which illuminates the student perspective on higher education. You may have seen the compelling videos “The Machine is Us/ing Us,” an exploration of the significance of Web 2.0 technologies, or “A Vision of Students Today,” which illuminates the student perspective on higher education. Both videos were created by Michael Wesch, anthropologist at Kansas State University, who has recently published a new version of the “Vision of Students Today” project. Wesch asked students to submit their own videos, which he then remixed into a version called “Visions of Students Today.” You can view his remix, as well as many of the original videos, here. Michael Wesch spoke on “Mediated Culture / Mediated Education” at TLISI 2009. You can view the video of his talk here. Posted June 20, 2011 by Theresa Schlafly & filed under Articles & Videos. A recent Washington Post article entitled "Wikipedia goes to class" highlighted area universities' participation in the Wikimedia Foundation's Public Policy Initiative. The Wikimedia Foundation is partnering with universities to incorporate the writing and revising of Wikipedia articles into academic coursework, with the aims of improving Wikipedia content and of giving students experience writing for a wider audience. Georgetown professor Rochelle Davis has participated in the Wikipedia Project with her undergraduate and graduate classes in the School of Foreign Service. She asked her students to create Wikipedia articles as a preliminary step to writing formal academic papers. She found that the students developed a greater awareness of their writing style and audience, and reported that the resulting papers were "the best papers I’ve ever read at Georgetown." CNDLS' Rob Pongsajapan, who acts as a campus ambassador for the project, has helped teach students how to edit Wikipedia articles. He's found it interesting to watch how students' perceptions of Wikipedia change as they become involved with the behind-the-scenes editing process. For more on the Wikipedia Project, see this page on the Teaching Commons and this CNDLS blog post from January. A recent Washington Post article entitled "Wikipedia goes to class" highlighted area universities' participation in the Wikimedia Foundation's Public Policy Initiative. A recent Washington Post article entitled “Wikipedia goes to class” highlighted area universities’ participation in the Wikimedia Foundation’s Public Policy Initiative. The Wikimedia Foundation is partnering with universities to incorporate the writing and revising of Wikipedia articles into academic coursework, with the aims of improving Wikipedia content and of giving students experience writing for a wider audience. CNDLS’ Rob Pongsajapan, who acts as a campus ambassador for the project, has helped teach students how to edit Wikipedia articles. He’s found it interesting to watch how students’ perceptions of Wikipedia change as they become involved with the behind-the-scenes editing process. For more on the Wikipedia Project, see this page on the Teaching Commons and this CNDLS blog post from January. Posted June 6, 2011 by Theresa Schlafly & filed under Articles & Videos. Georgetown University has been named to the 2010 President’s Higher Education Community Service Honor Roll for its reflection of “the values of exemplary community service” and its achievement of “meaningful outcomes.” The Jesuit Universities Humanitarian Action Network (JUHAN) is proud to play a role in this effort by supporting collaborative service trips and by establishing the JUHAN Student Service Fellow for the 2011-2012 academic year. This fellow will work with already established service groups on campus to provide support and expansion. For more information about Georgetown’s honor, please see the university’s news article. To learn more about JUHAN, please visit the JUHAN project site. Posted May 17, 2011 by Caroline Williams & filed under Announcements. The following post is by Steven Schwartz, Associate Dean for Clinical Informatics at the Georgetown University Medical Center. It was originally posted on the Lecture Capture Community of Practice blog. In the School of Medicine, we have been capturing the audio of lectures for some time and making these recordings available to students for study and review. More robust lecture capture will record screen as well as audio allowing learners to view powerpoint in sync with audio, or capture just about anything that is on the screen; web pages, smartboard drawings and annotation. Dr. Sue Mulroney has captured hours of lecture using the smart board in the GI Module and other SMP courses. I got to see one and it was quite slick. (I'll see if she will give me a link to post here). Screen Capture however opens up opportunity for new methods of teaching including "pre-casting" micro-lessons and self-directed learning. I have found it particularly useful for demonstration training of Electronic Medical Record skills. Pre-casting (for a class) is essentially pre-recording a lecture or other content that students view before class. Class time can then be used to review more difficult concepts, or provide activities for higher levels of learning such as problem sets or team based learning activities. Dr. Weinfeld and I put together these two lessons on Electronic Prescribing Basics and Clinical Decision Support as pre-casts to the self directed learning exercises for Electronic Prescribing. Why are classroom lectures all 50 minutes? With a Pre-cast you can make it as long or as short as you need - these are each about 30 minutes. Micro-lessons are screen captures that I will define as 10 minutes or less. Tips can be 30 seconds- 2 minute captures. Though one cannot provide comprehensive information in this short amount of time, it is well know that the learner's attention span is brief, perhaps up to 20 minutes in a classroom lecture. Providing small digestible bites of information keep the learners attention and usually answer a specific question, or demonstrate a particular concept. With a bank of micro lessons the learner can move through them at their own pace and in the order that works best for them, repeating the sections they need. Here is a micro-lesson we used with the M2 ePrescribing activity on pediatric dosing which combines use of Power point plus demo. It is 7 minutes long. I took me about 1 hour of conceiving the content making the PPT practicing the demo and then recording on 2 takes. In my practice we are using micro lessons to teach features of the electronic medical record. Here is a 3 minute micro lesson geared toward medical assistant staff on using the EMR to capture charges of office services. This took me 10 minutes to conceive set up record and post. I am very excited to work with the HOYA clinic coordinators to help develop micro lessons for their use of GE centricity as one training method for volunteers. We believe with an index of the micro skills volunteers can view perhaps 10-15 (3-minute) micro-lessons on their ride over to the clinic using the HOYA Clinic ipads. The university has been looking at Lecture capture solutions to fulfill the needs of academic continuity in the event of a natural or man made disaster such as blizzard flu or dirty bomb. The products under consideration have additional cool features such as text and audio search, so that if a student were looking at a 50-minute capture but wanted to find where "congestive heart failure" was discussed (on a slide or spoken) these newer tools could pull those sections out for easier review. Having these tool available combined with creativity of faculty and students should make for effective learning strategies in our new curriculum. The following post is by Steven Schwartz, Associate Dean for Clinical Informatics at the Georgetown University Medical Center. It was originally posted on the Lecture Capture Community of Practice blog. In the School of Medicine, we have been capturing the audio of lectures for some time and making these recordings available to students for study and review. More robust lecture capture will record screen as well as audio allowing learners to view powerpoint in sync with audio, or capture just about anything that is on the screen; web pages, smartboard drawings and annotation. Dr. Sue Mulroney has captured hours of lecture using the smart board in the GI Module and other SMP courses. I got to see one and it was quite slick. (I’ll see if she will give me a link to post here). Screen Capture however opens up opportunity for new methods of teaching including “pre-casting” micro-lessons and self-directed learning. I have found it particularly useful for demonstration training of Electronic Medical Record skills. Pre-casting (for a class) is essentially pre-recording a lecture or other content that students view before class. Class time can then be used to review more difficult concepts, or provide activities for higher levels of learning such as problem sets or team based learning activities. Dr. Weinfeld and I put together these two lessons on Electronic Prescribing Basics and Clinical Decision Support as pre-casts to the self directed learning exercises for Electronic Prescribing. Why are classroom lectures all 50 minutes? With a Pre-cast you can make it as long or as short as you need – these are each about 30 minutes. Micro-lessons are screen captures that I will define as 10 minutes or less. Tips can be 30 seconds- 2 minute captures. Though one cannot provide comprehensive information in this short amount of time, it is well know that the learner’s attention span is brief, perhaps up to 20 minutes in a classroom lecture. Providing small digestible bites of information keep the learners attention and usually answer a specific question, or demonstrate a particular concept. With a bank of micro lessons the learner can move through them at their own pace and in the order that works best for them, repeating the sections they need. Here is a micro-lesson we used with the M2 ePrescribing activity on pediatric dosing which combines use of Power point plus demo. It is 7 minutes long. I took me about 1 hour of conceiving the content making the PPT practicing the demo and then recording on 2 takes. In my practice we are using micro lessons to teach features of the electronic medical record. Here is a 3 minute micro lesson geared toward medical assistant staff on using the EMR to capture charges of office services. This took me 10 minutes to conceive set up record and post. I am very excited to work with the HOYA clinic coordinators to help develop micro lessons for their use of GE centricity as one training method for volunteers. We believe with an index of the micro skills volunteers can view perhaps 10-15 (3-minute) micro-lessons on their ride over to the clinic using the HOYA Clinic ipads. The university has been looking at Lecture capture solutions to fulfill the needs of academic continuity in the event of a natural or man made disaster such as blizzard flu or dirty bomb. The products under consideration have additional cool features such as text and audio search, so that if a student were looking at a 50-minute capture but wanted to find where “congestive heart failure” was discussed (on a slide or spoken) these newer tools could pull those sections out for easier review. Having these tool available combined with creativity of faculty and students should make for effective learning strategies in our new curriculum. Posted May 16, 2011 by Steven Schwartz & filed under Commentary.